Most people are familiar with tinted windows and may even have them in their cars, or in their homes. Tinting is intended to block some of the light from entering the home in the hopes of cooling off the interior of the home. However, this may not be the best way to achieve this goal. Getting windows with a low-e coating may provide the heat reduction desired, but with much less disruption to the view. To better discuss this topic, there are a couple of terms that need to be defined. The first is the Solar Heat Gain Coefficient (SHGC). This is a measure of the heat (IR light) that is allowed through the glass and into the room. A second term is the Visible Light Transmittance (VLT). This is the measure of visible light that is transmitted through the glass and into the room. Each of these is measured from 0 to 1 where 0.0 allows nothing through the glass, and 1.00 is totally transmits 100% of the light. To keep a room cool, you would ideally want a low SHGC (IR light), but a high VLT (visible light) to allow in the view. With that out of the way, we can compare some values. 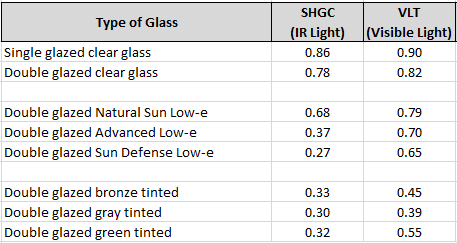 Below is a table of different types of window glazing with their corresponding SHGC and VLT values. As you can see, each pane of clear glass cuts down about 10% of both the total visible light and IR light. The table shows the three different types of low-e from Pella. Pella’s Natural Sun Low-e uses one Low-e coating and allows in most of the visible light at 79%. This low-e also allows in 68% of the IR light. There is not much change in either the IR or visible light transmittance into the room when compared to clear glass. The Low-e coating for ‘Natural Sun Low-e’ is placed to reflect IR light back inside the room. This Low-e coating allows in the heat and keeps it in, and is designed for colder climates. Pella’s Advnaced Low-e uses two Low-e coatings. The first reflects IR light back into the room to keep a warm room warm in the winter, but the second coating prevents most IR light from entering the room. This keeps a warm room warm, but also prevents the sun from heating it further. This Advanced Low-e coating is intended for moderate climates with both warm summers and cool winters, like most of New Zealand. Pella’s Sun Defense Low-E has three Low-e coatings designed to prevent nearly all IR light from entering the room. Sun Defense Low-e removes 73% of the IR light (heat), but still allows in 65% of the visible light. This Low-e coating is designed for very warm and sunny climates like deserts, which are not present in New Zealand. Now let’s compare the Low-e coatings to window tinting. Double Glazed Bronze Tint does remove 67% of the IR light, but only allows in 45% of the visible light. In addition, the bronze removes more of the green light leaving the view looking artificially more bronze/red. Double Glazed Gray Tint removes 70% of the IR light, but only allows in 39% of he visible light. This tinting removes visible light more evenly, so there is less colour distortion, but the view is visibly darker. Double glazed green tint removes 68% of the IR light, and does allow in 55% of the visible light. This tint removes more of the red light and leaves landscapes looking more green. This tint allows in the most visible light of the three tints, but still removes 27% more visible light than Advanced Low-e, and also distorts colours. The Low-e and tint coatings also treat the light in different ways. The tinting absorbs the sun and emits that energy as heat. This can actually heat up the glass in your windows and act like a radiator. The low-e coating reflects much more of the light back outside, absorbing very little light, and thereby stays cooler. For a little more information on how low-e coatings can cut down on the heat penetrating into your home, view this short video from Pella that uses a thermal camera to show the differences between clear glass and low-e glass. Screenshot of Thermal Imaging Between Low-e glass (top) and Clear Glass (bottom). ← Can you help getting windows approved by the council?